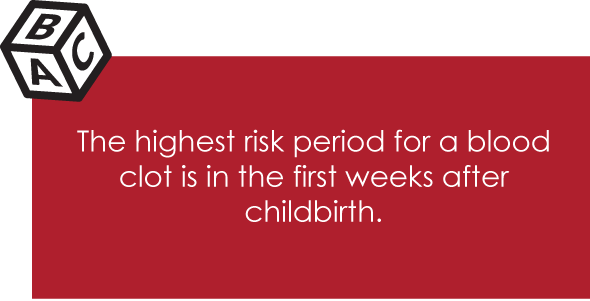 If you’re expecting or recently had a baby, know your risk for a dangerous blood clot. 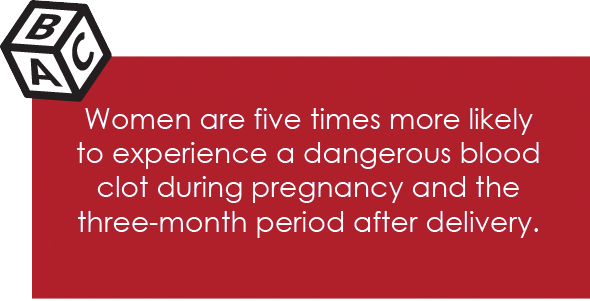 Women are 5X more likely to experience a dangerous blood clot during pregnancy and during the three months after pregnancy compared to women who are not pregnant. 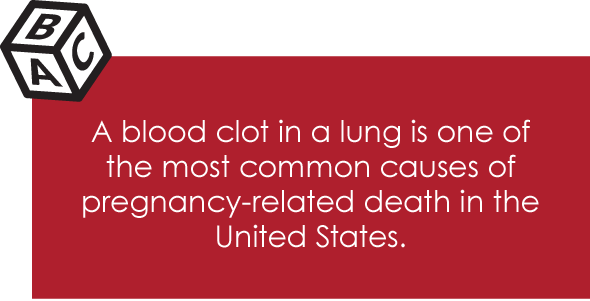 A blood clot in a lung is one of the leading causes of pregnancy-related death in the United States. Don’t let a blood clot spoil your joy. 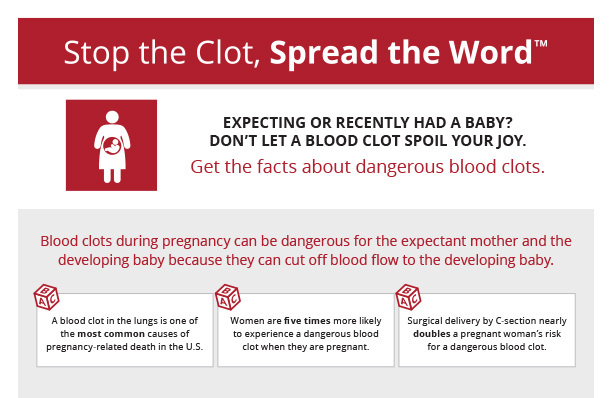 Dangerous blood clots during pregnancy, childbirth and up to three months after delivery can be prevented. Talk to your doctor about your risks and steps for prevention. Don’t let a blood clot spoil your joy. If you are expecting or recently had a baby, you know that it can be an exciting and joyful time. From doctor’s visits, where you might catch the first glimpse of your developing baby during an ultrasound, to decorating the nursery and picking out precious little baby clothes. Enjoy all of these special moments and plans. As you prepare for the day when your baby arrives, it is important that you take care of yourself. There is one key health issue that many women who are expecting a baby might overlook: dangerous blood clots. Pregnancy, childbirth, and the three-month period after delivery are times when there are major risks for the development of dangerous blood clots. With the right information and a prevention plan, blood clots may be prevented. Blood flow slows later in pregnancy, due to pressure on a woman’s blood vessels from the growing baby. A woman may experience injury to veins during delivery or surgery. 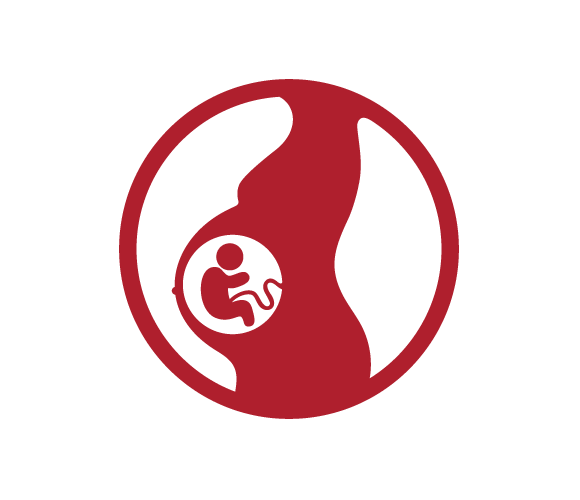 Prolonged immobility due to bed rest during pregnancy or while recovering from childbirth can cause blood to pool and slow blood flow. Dangerous blood clots can affect you and your developing baby. Blood clots can form in the deep veins of a woman’s legs or arms and block the flow of blood through the vein. Left untreated, blood clots in the legs or arms can break off and travel to the lungs, which can be life threatening. Blood clots during pregnancy also can be dangerous for the developing baby because they can cut off blood flow to the developing baby. 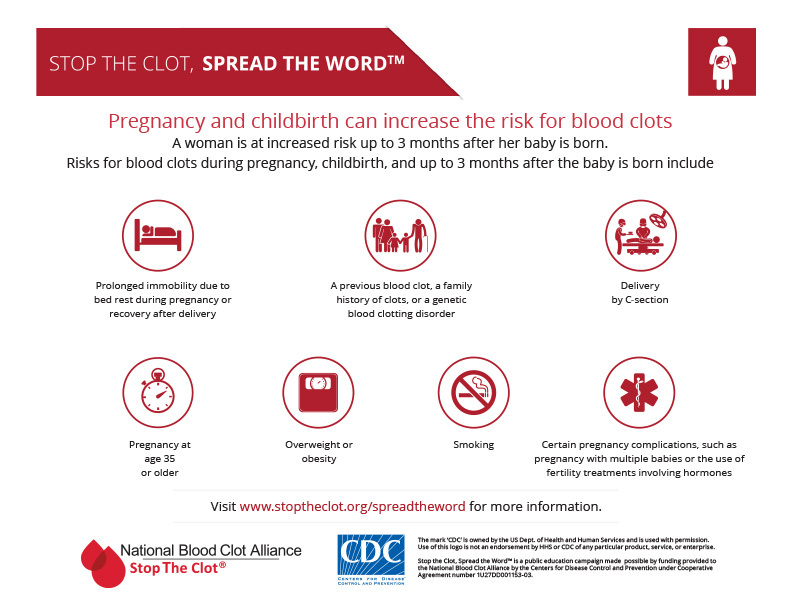 Click on the image to the right to view and share an infographic about the risk for blood clots during pregnancy, childbirth and up to three months after delivery. Watch this short video to learn how pregnancy and childbirth may put you at risk for a life-threatening blood clot. 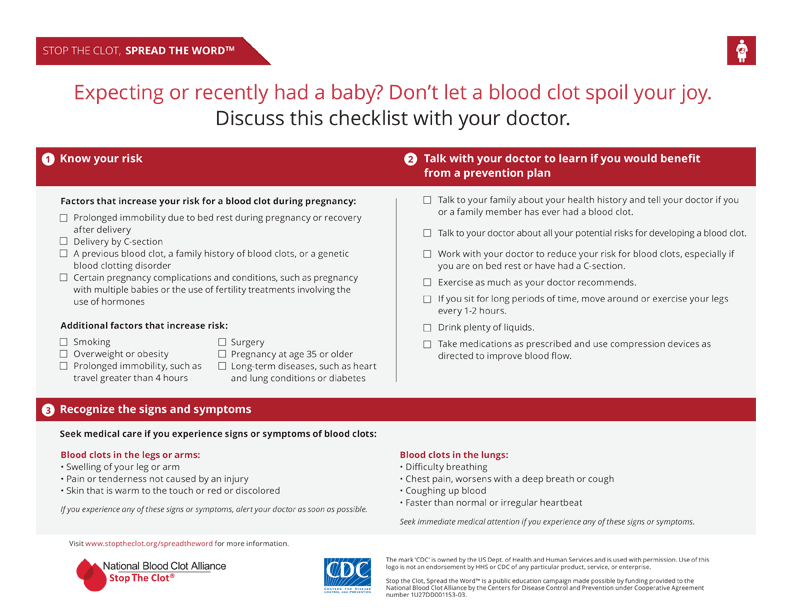 Risks for blood clots during pregnancy, childbirth, and up to three months after delivery. A woman is at increased risk for a dangerous blood clot throughout her pregnancy, during childbirth, and up to three months after her baby is born. When you take care of yourself, you take care of your developing baby too. When blood clots connected to pregnancy form in the legs or lungs, one-half of them occur during pregnancy, and one-half occur in the three-month period after the baby is born. Click on the image below to download a list of factors that can help you and your doctor determine your blood clot risk. Cherish the experience of pregnancy and childbirth. Talk to your doctor to learn if you might benefit from a blood clot prevention plan. Talk to your doctor about all of your potential risks for developing blood clots. Work with your doctor to reduce your risk for blood clots, especially if you are on bed rest, have a history of blood clots, or have had a C-section. Exercise as much as your doctor recommends. If you sit for long periods of time, move around or exercise your legs frequently. Drink plenty of liquids. Recommend that women drink 10, eight-ounce glasses of liquid every day while pregnant, and 12-13 glasses of liquid every day while breastfeeding. Take medications and use compression devices as prescribed. Women at increased risk for dangerous blood clots, or previously diagnosed with a blood clot, should discuss options to prevent blood clots with their doctor. If a pregnant woman is at higher risk for developing blood clots, her doctor may prescribe one or more methods to prevent blood clots during her pregnancy and up to three months after her baby is born. Compression stockings or compression devices that help to keep blood moving in the legs. An anticoagulation medicine, also called a blood thinner, that does not affect the developing baby. Tell your doctor if you experience any of the signs or symptoms of a blood clot. Seek immediate attention if you experience these signs or symptoms. The National Blood Clot Alliance and the Centers for Disease Control and Prevention are working on this important public health campaign to get the word out about blood clot risks and the signs and symptoms of blood clots. Stop the Clot, Spread the Word™ is a public education campaign made possible by funding provided to the National Blood Clot Alliance by the Centers for Disease Control and Prevention under Cooperative Agreement number 1U27DD001153-02. The mark ‘CDC’ is owned by the US Dept. of Health and Human Services and is used with permission. Use of this logo is not an endorsement by HHS or CDC of any particular product, service, or enterprise.